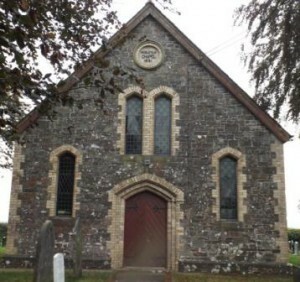 The original Methodist chapel in Woodacott was built in 1833, for £100 and is on the opposite side of the Green to the current Chapel. In the 1851 Religious Census, more properly called the census of “accommodation and attendance at worship”, conducted on March 30th 1851, its Society steward was Richard Carter from Sutcombe, who farmed 160 acres at Woodacott with 2 labourers. In terms of Chapel attendance on that Sunday, Mr Carter recorded 120 attending in the afternoon and 150 in the evening. As there was room for 134 sitting and 25 standing this does seem to be a rather optimistic assessment of attendance. It is often stated that the 1851 religious census figures of attendance are not accurate. Sometimes the minister (or person reporting) rounded off the number. Local circumstances such as rain or an epidemic meant fewer than usual attended church that Sunday. 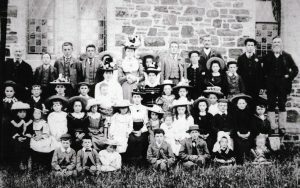 Established ministers accused the dissenting churches of packing more people in than normally attended to boost their numbers. 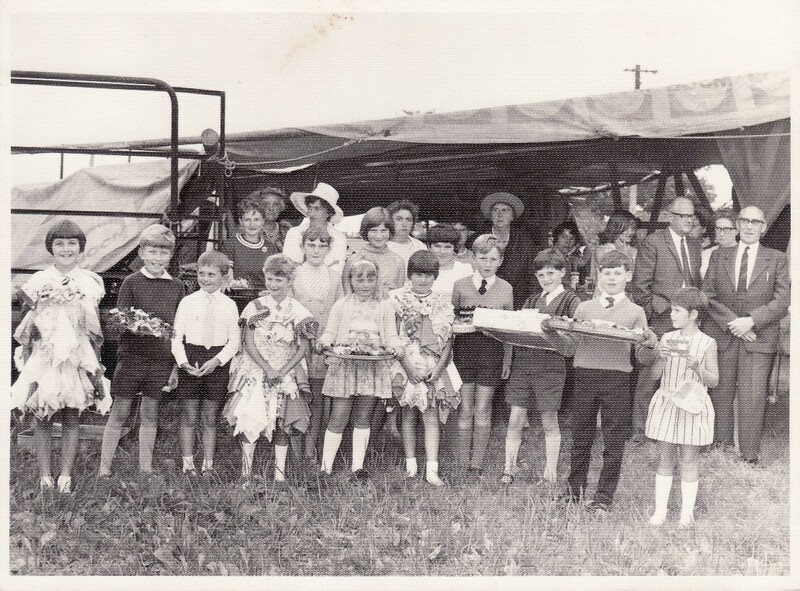 Mr Peter Sanders on behalf of the Church also reported that between 150 and 200 attended out of a population of 409 so this optimism was not confined to the Chapel. 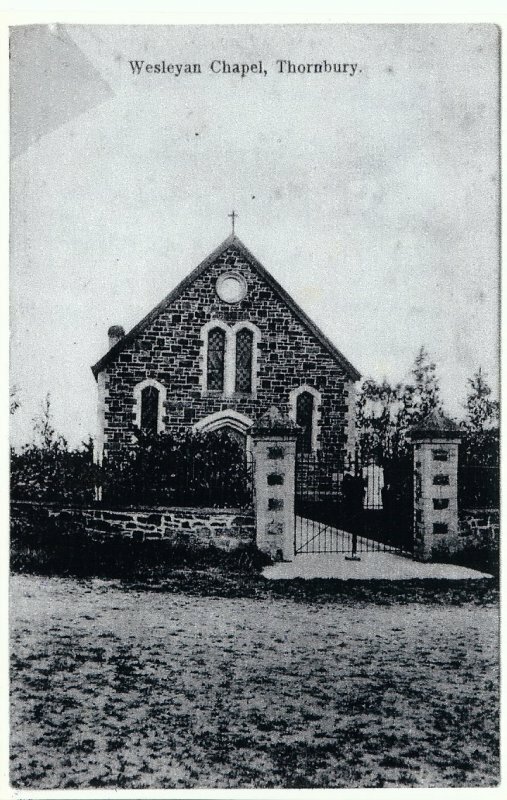 In 1891 the new Wesleyan Chapel was built on the opposite side of the Green. 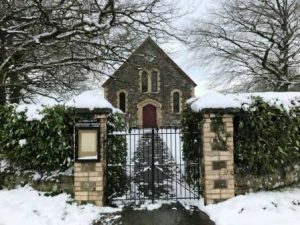 It is said that the stones to build the Chapel came from Lopthorne Quarry on George Priest’s land and were brought there by local farmers using their own horses and carts. 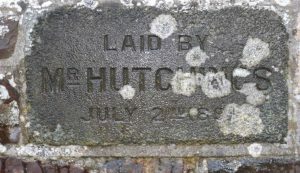 It is likely that is was built by John and Albert Heard from Bradford who were stone masons and the foundation stones in the walls, such as this one laid by Mr Hutchings, commemorate residents who contributed financially to the cost of the building. 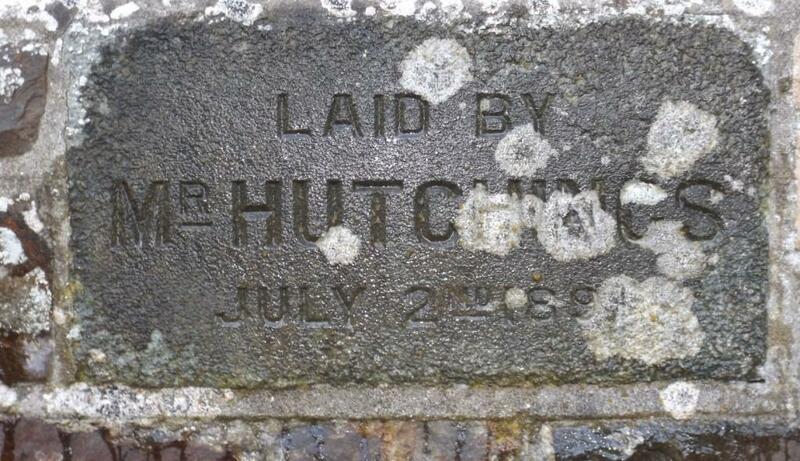 There was a stable inside the gate on the lane to Kingsford, and in 1958 there was a proposal to turn this into a ‘Convenience’ or a store room but this was not carried out. The new Chapel was officially opened on October 24th 1891 by the Reverend J Rodwell of Launceston. 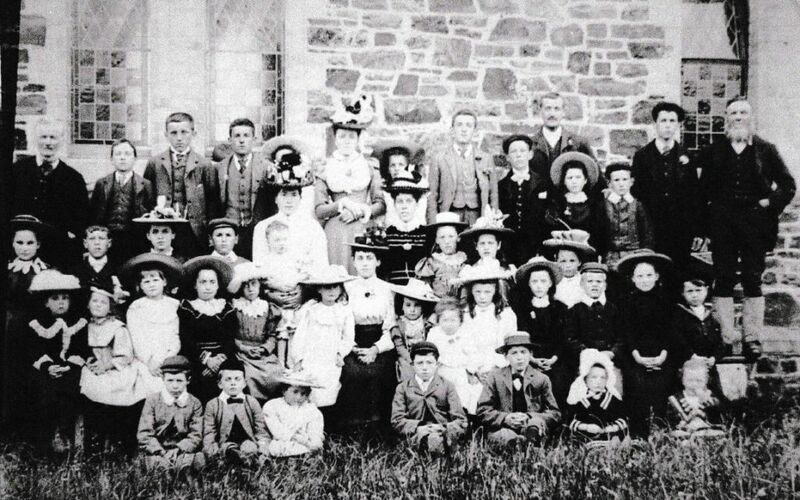 This picture shows a gathering outside the Chapel, do you know who any of the people are? Judging by the clothing it was taken around the time of the opening if not actually at that event. The interior of the Chapel has remained largely unchanged apart from the installation of a platform and a pulpit at the front of the Chapel in 1923 and the addition of a wooden cross made by Raymond Ayres from Cranapool. The Chapel was renovated in, I believe, 1969, and this picture shows the attendees outside the front of the Chapel. 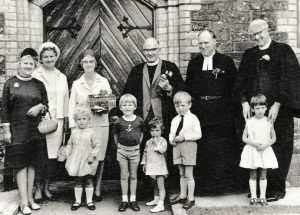 This picture, also believed to be from 1969, taken outside the front door of the Chapel shows (back row) Mrs G Ley, Mary Popham (Organist), Mrs G Hutchings, Reverend Wood, Reverend Baker and the District representative. Front row: Linda Sillifant, Billy Francis. Sylvia Priest, Graham Sanders and Linda Jollow. At the centenary celebrations in October 1991, at which former Sunday School Scholars acted as stewards and servers, there was a concert by the Compare Male Voice Quartet followed by a celebratory supper. The next day there was a service followed by another supper and a total of £649 was raised. Present over the weekend were the Reverend Paul Hardy, the Circuit Minister and Sir Peter Mills. 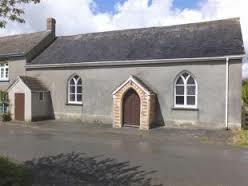 The old Chapel became a Sunday School after the new one was built, but was sold in October 2001. The Chapel closed for worship in February 2018: please contact us for any queries regarding the graveyard inscriptions. The Chapel is pictured here in 2016, and in the snow of March 2018.